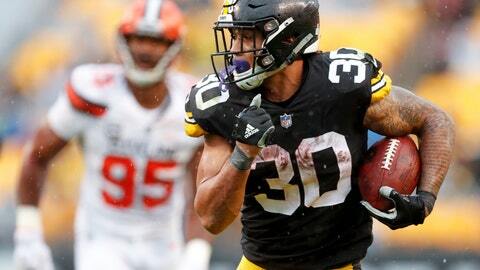 PITTSBURGH (AP) — The Pittsburgh Steelers aren’t surprised by the success of second-year running back James Conner. Conner continues to shine in the spotlight while two-time All-Pro running back Le’Veon Bell remains away from the team. Conner enjoyed a history-making day, accounting for more than 200 all-purpose yards during the Steelers’ 33-18 home win against Cleveland on Sunday. Bell, who finished as the NFL’s third-leading rusher last season, still has not reported nor signed his one-year, $14.5 million franchise tender. Conner has taken full advantage while Bell has been away. He finished Sunday’s game with 212 all-purpose yards, just 25 fewer than the Browns totaled as a team. Conner, a 2017 third-round pick, rushed for 146 yards and two touchdowns. He also caught five passes for 66 yards. He also made history while he was at it. Conner is the first Steeler to rush for at least 100 yards and two touchdowns in three straight games. He eclipsed 100 yards rushing for the third straight game and fifth time this season. Now, the rest of the league is taking notice. Conner’s nine touchdowns rank second in the NFL and his 599 rushing yards are third. Conner, a former University of Pittsburgh standout, is also tied for the most touchdown runs, and has the second-most yards from scrimmage — 922 — through the first seven games of a season in team history. “I had a front-row seat for his college exploits, so we are not surprised by his talents, play, demeanor, or his displays of will,” said Steelers coach Mike Tomlin, whose team shares a practice facility with Pitt. Conner rushed for 135 yards, gained 192 all-purpose yards and finished with two scores during the season opener at Cleveland. He has 281 yards rushing, 404 all-purpose and four touchdowns in two games against the Browns. It wasn’t easy for Conner on Sunday: Conner had 36 yards rushing on his first 12 carries. But on his next 12, Conner added 110 yards rushing. By the third quarter, the fans at Heinz Field were chanting his name — “CON-NER,” ”CON-NER,” — when he finished the period with 114 all-purpose yards. Conner didn’t allow the slow start to affect his play. Conner enjoyed a strong finish with 60 of 75 yards, including a 12-yard touchdown, during a third-quarter scoring drive that gave the Steelers an 11-point lead. He added a 22-yard touchdown run in the fourth quarter. Conner seeks a strong finish to the season, of course.